Special Coordinator of the Joint Mission of the OPCW and the UN to eliminate Syria’s chemical weapons programme, Sigrid Kaag, speaks to journalists following a closed-door meeting of the Security Council. A recent acceleration of efforts by Syria and the submission of a revised timeline for removing toxic agents bode well for meeting the 30 June 2014 deadline for destroying the country’s chemical weapons programme, the official charged with overseeing the venture said today after briefing the United Nations Security Council on progress to date. On Tuesday the Joint Mission of the Organisation for the Prohibition of Chemical Weapons (OPCW) and the United Nations verified that two more consignments of chemicals left the port of Latakia, including a quantity of mustard gas – a Priority 1 chemical – which was reported last Wednesday. Another movement, a significant consignment of other Priority 1 chemicals, is scheduled to arrive in Latakia during this week, which will bring the total number of movements so far to six. Prior to initiating operations in January to remove its chemicals, Syria in late 2013 completed the functional destruction of its chemical weapons production facilities, mixing and filling equipment, and all of its munitions that were designed for use with chemical warfare agents. “If we combine removal and destruction, the Mission has concluded now that about one-third of Syria’s chemical weapons materiel has been removed or destroyed,” said Sigrid Kaag, the Special Coordinator of the Joint Mission. In addition, Syria yesterday submitted a revised proposal to the OPCW that aims to complete the removal of all chemicals from the country before the end of next month. Speaking to reporters after a closed-door briefing to the Security Council, Ms. Kaag said there has been an “intensification of effort” in the last few days by the Syrian authorities. The six consignments so far represent more than 35 per cent of all chemicals that must be removed from Syria for destruction. 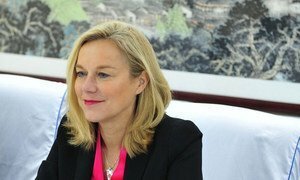 Ms. Kaag said that she expected that number to reach 40-41 per cent in the next few days. “With a lot of continued effort, hard work, and support by the international community, we look forward to see continued progress. But it remains hard work,” she said, adding that March is a “critical” month to look at continued progress toward the overall deadline of 30 June. Yesterday, Ms. Kaag was in The Hague, where she briefed the OPCW Executive Council on recent progress in the Syrian mission. In his addressing to that session, OPCW Director-General Ahmet Üzümcü said that all materials and equipment required by Syria are now in place for the expeditious removal of its remaining chemicals, including armoured jackets for the protection of containers. The Joint Mission of the Organization for the Prohibition of Chemical Weapons (OPCW) and the United Nations confirmed today that a shipment of Syria’s stockpile of sulphur mustard, commonly known as “mustard gas,” has left its territory.